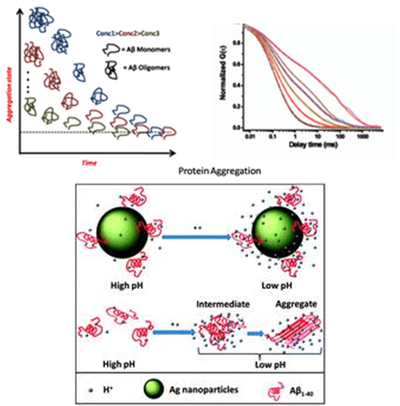 Cell-Membrane-Mimicking Lipid-Coated Silver Nanoparticles for deducing membrane protein structure. In our laboratory we aim to investigate biophysically tractable yet biologically interesting systems, using (mostly) spectroscopic and imaging tools. Our recent focus has been on two problems: protein misfolding/aggregation, and vesicular neurotransmission. Both of these interface with the phenomenon of amyloid-induced neuro-degeneration. Alzheimer’s Amyloid beta is a small peptide, and therefore expected to be more tractable at a molecular level compared to typical proteins. Yet it is uniquely interesting in the biological context. We have developed single molecule level fluorescence tools specifically suited for studying amyloid misfolding and aggregation. 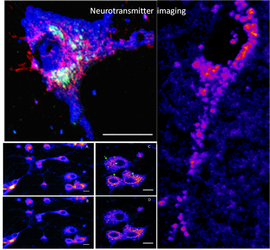 On the other hand, vesicular neurotransmission is a multifaceted phenomena and therefore difficult to simplify beyond the level of single neurons. However, monoaminergic vesicles can be tracked with unique label-free imaging techniques that we have developed in the lab. We hope that a combination of these two techniques, together with other tools, will help us uncover the fundamental mechanisms underlying protein misfolding, aggregation and toxicity. The work described here, undertaken in the last few years, involve different aspects of these themes. In addition, development of biophotonic instrumentation and methodology has been a frequent offshoot of this work in the lab. • Mr. Anirban Das has received Medhavini Housur Memorial Best Poster Award, 2018 in PAN-TIFR Chemistry Meet, 2018. • Dr. Bappaditya Chandra has received best thesis award in TIFR, Mumbai, 2018. • Barun Kumar Maity has received best poster award in the FCS 2017, IIT G.
• "Best Poster" in IDP, 2017: Barun Kumar Maity, Simly Dey and Bappaditya Chandra have received best poster awards in the international conference IDP 2017, IISER Mohali. • "Best Poster" in Biophysical Society Annual Meeting: Bappaditya Chandra got the best poster award (in the category: Intrinsically Disorder Proteins) in the Biophysical Society Annual Meeting, New Orleans, 2017. 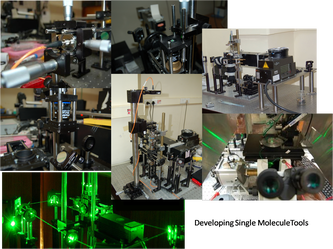 • FCS 2018, National Workshop on Fluorescence and Raman Spectroscopy: Nov 12-17, 2018, JNU, New Delhi. • Biophysics Paschim: Tuesday, 28th of March, 2017, TIFR, Mumbai.